When I was younger my teeth had always been perfectly straight but as I got older they all started to move. My front two teeth were pushing back the way and my eye teeth were beginning to move out the way. I became more aware of this happening and started to become quite self conscious about showing my teeth and smiling. Last year my sister recommended Geoff to me and said to contact him about getting braces fitted. I didn’t think this was possible as I thought it would be too expensive. On my first appointment Geoff talked me through what he would do and gave me a quote – I couldn’t believe how reasonable the price was so I jumped at the chance. I was a bit nervous about having these fitted as I thought they would be really sore and uncomfortable – quite the opposite! I hardly felt them and because they were clear nobody even noticed I was wearing them. 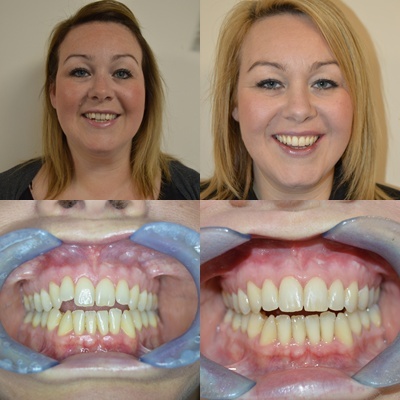 On my last appointment 4 months later I had the braces removed – I could not believe how quickly my teeth had moved, everyone was commenting how straight and lovely they were – and now I can’t stop smiling – properly. I can’t thank Geoff and his team enough for all their help. They made me feel so welcome and at ease in each appointment. Such a lovely dental practice with great staff. Thank you for my new perfect smile. All consultations are free at Bannockburn Dental Practice.